Two years ago, Roger Deere traveled to an eastern Ohio coal town, where he visited a four-room Sears pre-fabricated house whose ceiling bowed down from the weight of all the stuff in the attic. The homeowner had died; a relative poking through the accumulation had run across something he thought might be of interest to Deere. Along with everything else, the attic contained the radio equipment for a B-17 bomber. Deere did not ask how radio equipment got into the attic. He did not want an explanation; he wanted the equipment. 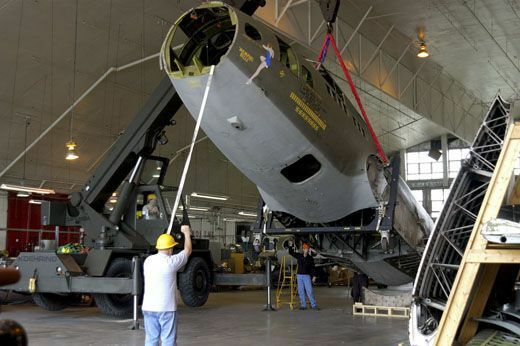 In time, it will be placed in the Memphis Belle, a Boeing B-17F Flying Fortress now being restored at the National Museum of the U.S. Air Force in Dayton, Ohio, where Deere is the chief of the restoration division. 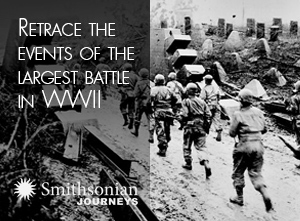 During World War II, the U.S. Army Air Forces required heavy-bomber crews to complete 25 missions before they could go home. In 1943, having flown over France, Belgium, and Germany, the Memphis Belle crew became one of the first to reach that goal. After returning to the States in June 1943, the bomber and many of its crew served as the centerpiece of a 31-city War Bonds tour. Academy Award-winning director William Wyler documented the Belle’s service in a 41-minute color film (Europe. The bomber retains its fame today. Those too young to remember it from the war may know its story from the fictionalized 1990 movie Memphis Belle, or from the B-17 (used in that movie) that now tours airshows in Belle markings. The real Belle owes its present-day survival to a combination of romance and civic pride. In 1946, it was sitting with hundreds of other B-17s in Altus, Oklahoma, ready to be chopped up for scrap. A newspaper reporter learned of its fate and told Memphis mayor Walter Chandler; Chandler bought the B-17, originally costing $314,000, for the $350 salvage price as a way to honor the city’s namesake (“Memphis Belle” is a tribute to resident Margaret Polk, the pilot’s girlfriend). But after six decades, local groups concluded they could not raise the funds to complete a needed restoration. In 2004, the Air Force announced plans to relocate the aircraft to its national museum and finish restoring it. The next year, two convoys trucked the disassembled aircraft to the cluttered World War II-era hangars that now house the restoration effort. When, five or more years from now, the work is complete, the museum will permanently display the Belle to visitors. In 25 missions the Memphis Belle had its tail splintered, five engines shot out, and its body pocked with hundreds of holes from German flak. The worst damage, however, came in peacetime: Vandals made off with almost everything not fastened down; “Sometimes they pried things off the walls,” says Deere. The Belle is now missing most of the interior: the pilot, copilot, and navigator seats, the control yokes, and much more. Finding replacements is difficult. While the United States built 13,700 B-17s, fewer than 100 remain. 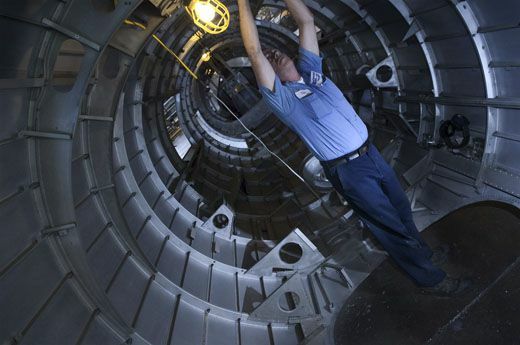 “There are structural parts we’re never going to find unless somebody runs across a B-17 sitting out in a field somewhere,” Deere says. For some pieces, replacements are being fabricated. Molds have been made for the plexiglass in the top turret, and for an aft fuselage ring frame. 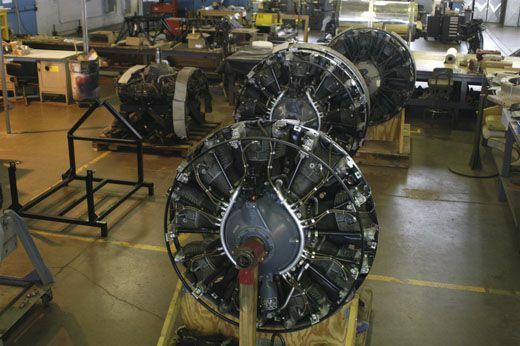 The engines that came with the Memphis Belle’s other parts were not original to a B-17, so they’ll be replaced with rebuilds assembled from the museum’s substantial accumulation of aircraft parts. The original cloth-coated wire is no longer made in the United States, so the restorers are buying it new in Great Britain. Though the wires will be out of sight, the restorers are intent on making the aircraft as authentic as possible. As for the body, all the paint is being stripped. Paint, Deere says, “hides a lot of corrosion. We want to get it stripped down so we can undertake the structural repairs first.” The work is slow, in part because no chemical strippers are being used on the interior. “Manufacturers claim their chemicals are not corrosive,” says Deere. “Maybe it’s not corrosive now, but what about in five or ten years?” Working with the restorers, private-sector chemists modified an existing product into a sand-like dry stripper that addressed Deere’s concerns. 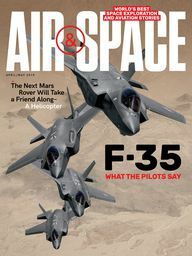 The entire aircraft should be stripped by year’s end. Besides revealing underlying corrosion, stripping brought to daylight more than 1,000 names inscribed in the aircraft’s tail and fuselage by the public during the bond drive. The names have been photographed; they will disappear again when the aircraft is repainted. The aircraft arrived with several large patches on its tail. They were quick-and-easy fixes made with flat sheet metal; the original tail, however, had a compound contour. Those are much harder to fabricate. Staff efforts are supported by volunteers. 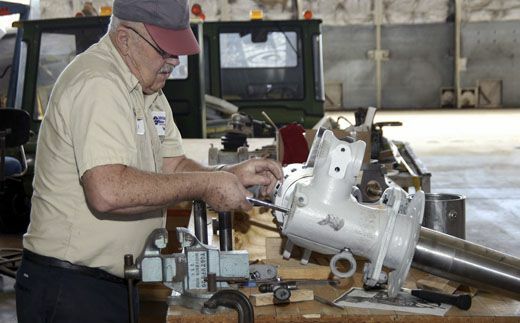 The head restorer of the tail gun is John Vance, whose father was a B-17 tail gunner. Volunteers Chuck Flaum and Steve Markman built 10 replicas of the wooden carriers that held the oxygen bottles crew members carried while moving inside the unpressurized craft. They found the original blueprints on microfiche at the National Archives.